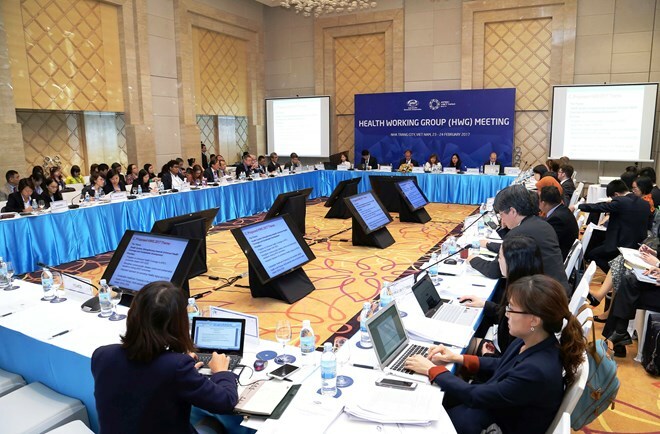 HCM City (VNA) – Health officials from the Asia-Pacific Economic Cooperation (APEC) are expected to have a hectic day in Ho Chi Minh City on August 22 with two policy dialogues and one meeting of the Health Working Group (HWG). One policy dialogue will focus on accelerating action on tuberculosis (TB) and multi-drug resistant tuberculosis (MDR TB) and the other will deal with promoting healthy aging and non-communicable diseases (NCD) control for a healthy Asia - Pacific region. At the same time, the HWG Meeting will enter the second working day after completing a lot of work on August 21. The Intellectual Property Rights Experts Group, the Investment Experts’ Group, the Emergency Preparedness Working Group, the Anti-Corruption and Transparency Working Group, the Mobility Group and the Electronic Commerce Steering Group-Data Privacy Subgroup will also meet on August 22. Besides, APEC officials will mull over other issues relating to customs procedures, trade and investment, chemicals, standards and conformance, and the services sector. In the Mekong Delta city of Can Tho, APEC officials will continue with the Policy Partnership on Food Security Meeting and the Ocean and Fisheries Working Group Meeting.